Roll out the pastry on a lightly floured surface until large enough to line a 23cm ‘deep dish’ tart tin. Trim the excess pastry from around the edge, then line the pastry case with baking paper, fill with baking beans and chill for 30 mins. Heat oven to 180’c. Bake the pastry case for 15 mins, then carefully lift out the baking paper and beans, and bake for 5 mins. Set aside. Cook the peaches on a medium heat until soft, pureed and peach juice has reduced, about 5 minutes. Place the cream, milk, sugar and vanilla bean in a medium saucepan. Bring to a simmer. In a separate bowl, whisk together the eggs and egg yolks. Temper the hot milk mixture into the eggs while whisking. Strain the custard through a fine sieve and let it cool in an ice bath slightly. Spread a layer of the peaches on the pastry pie base and top with the custard. Bake at 180’c for about 30-40 minutes or until the center is set. Let them cool completely. 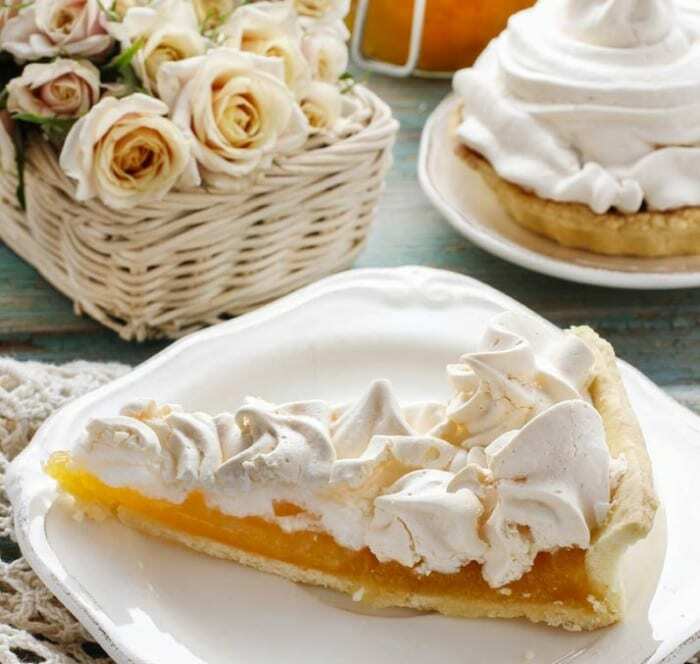 Once ready to serve, make the Swiss meringue by placing the egg whites into a heatproof bowl set over a pan of simmering water and lightly whisking until the egg whites reach soft peak stage. Add the sugar and whisk until all the sugar has dissolved and the mixture is warm to the touch. Remove the bowl from the heat and using an electric mixer whisk for 5-10 minutes or until the meringue forms stiff peaks. 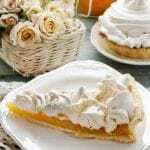 Spread the meringue on top of the pie and use a kitchen blowtorch to burnish the outside of the pie into a rich golden brown.